A pastiche of the famous Saul Steinberg New Yorker cover. 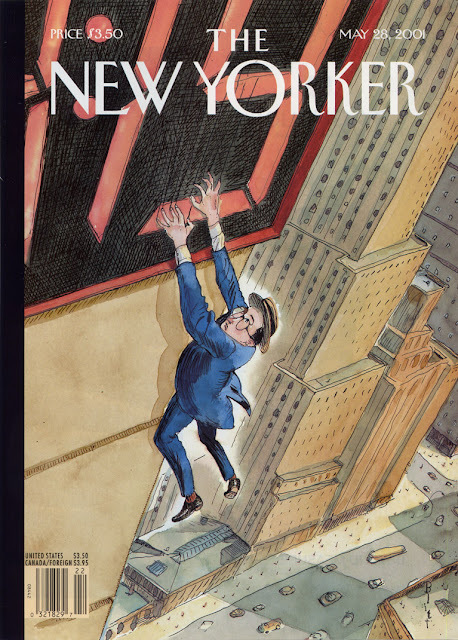 Barry Blitt’s cover of the July 21, 2008, issue of The New Yorker, entitled “The Politics of Fear,” sought to satirize the many rumors that had been circulating about presidential candidate Barack Obama and his wife, Michelle. 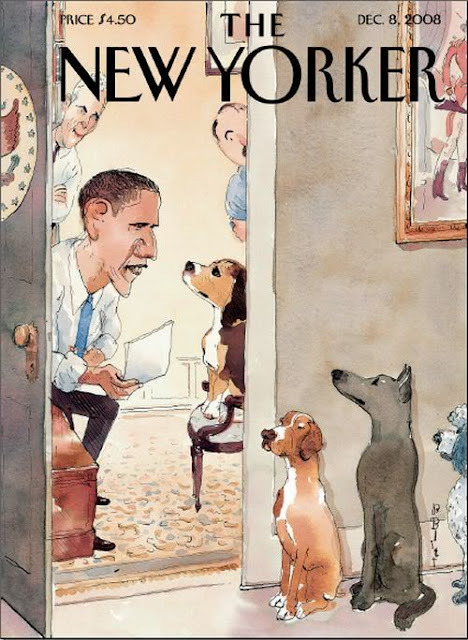 The cover inspired a fierce debate about the nature and effectiveness of satire, but it is worth noting that the stereotypes depicted in Blitt’s drawing were rarely levied against the Obamas from that point forward, and soon faded from prominence in the national political conversation. 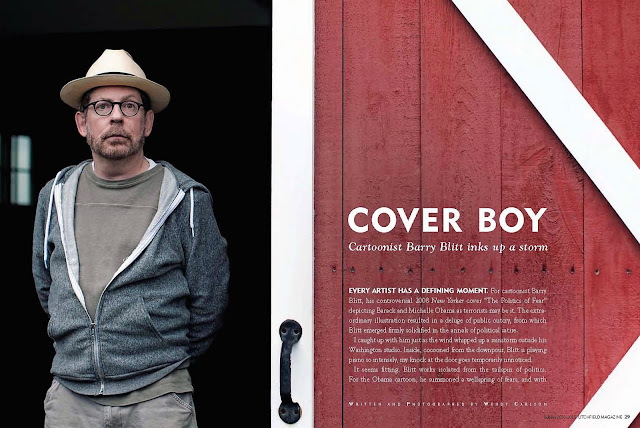 A 2010 interview with Barry Blitt by Wendy Carlson in Townvibe. Every artist has a defining moment. 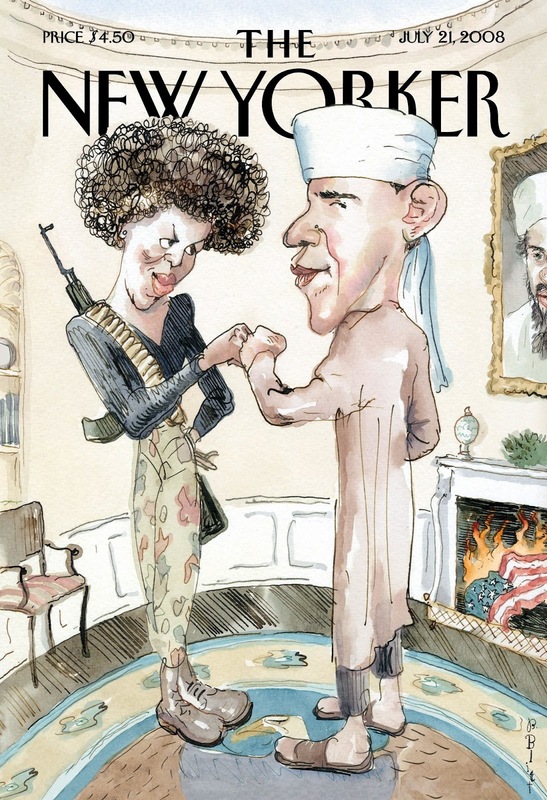 For cartoonist Barry Blitt, his controversial 2008 New Yorker cover “The Politics of Fear” depicting Barack and Michelle Obama as terrorists may be it. 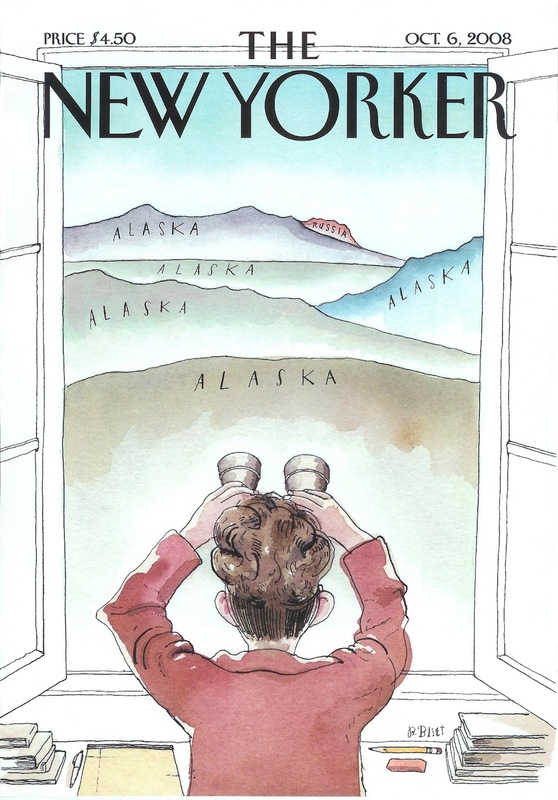 The extra­ordinary illustration resulted in a deluge of public outcry, from which Blitt emerged firmly solidified in the annals of political satire. I caught up with him just as the wind whipped up a rainstorm outside his Washington studio. Inside, cocooned from the downpour, Blitt is playing piano so intensely, my knock at the door goes temporarily unnoticed. It seems fitting. Blitt works isolated from the tailspin of politics. For the Obama cartoon, he summoned a wellspring of fears, and with fly-swatter swiftness, nailed it in a single graphic that combined humor, brilliance, and art. Sometimes, as with that cover, he cuts unsparingly to the bone. “I have no boundaries, I do anything at anyone’s expense,” Blitt says jokingly, or perhaps not. It’s hard to know precisely whether he’s being cynical or sincere. Blitt himself is visibly ill at ease under the spotlight. He shoots me a deer-caught-in-the-headlights look from under his hat. “Is this almost over?” he asks before we’ve even begun. And so we bounce between sincerity and sarcasm—mostly the latter. I ask him about being Canadian. “I do have a green card, if you need to see it. I mean if that’s what you’re here for. I can produce all the necessary paperwork,” he replies. Growing up in Montreal, Blitt was known as the student who drew in class. “I was a sweet kid. I drew cartoons and creatures, mostly of baseball players, Popeye, teachers, friends. I didn’t draw anything vulgar like the Obama stuff,” he says. It wasn’t until after graduating from the Ontario College of Art and Design in Toronto that Blitt first started drawing political cartoons for Toronto Magazine. Soon, he was contributing to American magazines such as Rolling Stone. When Sports Illustrated hired his wife, Teresa, as a designer, the couple relocated to New York City, where Blitt enjoyed a ten-year stint drawing half-page celebrity cartoons for Entertainment Weekly. 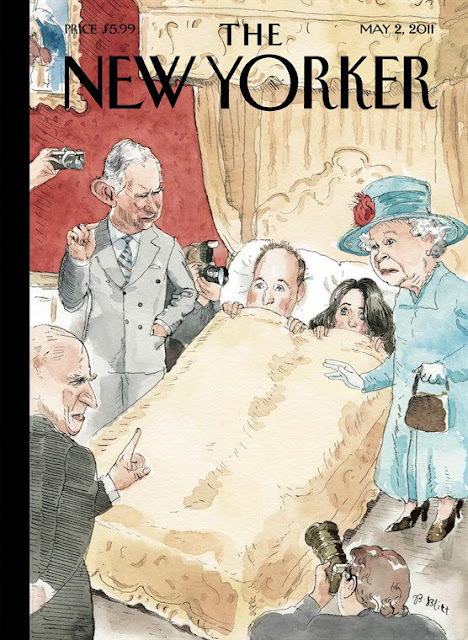 Flash forward ten years and suddenly politics had become pop culture, says Blitt. “It wasn’t that way when I was growing up, but maybe with the advent of the Internet, it just seemed like a lot of other people were finding politics as crass as I did,” he says. These days Blitt keeps up with current affairs online. The challenge for cartoonists today is that “satire is everywhere; you come up with ideas and someone’s done them. ‘The Daily Show’ and ‘The Colbert Report,’ these guys are doing it every day,” he says. Perhaps, for that reason, his work tends to be more provocative. “Like the cartoon of Hillary Clinton and Barack Obama together in bed,” he says. “It was during the campaign when Clinton asked who’d you want to answer the red phone,” and the two are looking nervously at each other as the red phone on the bedside table rings. Of course, after this past November’s election, Blitt revisited “The Politics of Fear” cover with another New Yorker cover, this one of Obama and a fist-pumping John Boehner, the likely Speaker of the House. There is, I discover, another side to Blitt. He illustrates children’s picture books. He recently completed The Adventures of Mark Twain by Huckleberry Finn (Simon & Schuster), a biography by Robert Burleigh due out in March. He also illustrates Frank Rich’s op-ed column in the New York Times. Today appears to be one of the latter. “Now that I’m a professional illustrator, drawing’s no fun anymore,” he says. “I enjoy playing the piano and animal husbandry. Just kidding. I don’t even know what that is.